Z-Balloon Adventures owner/operator is Dan Campbell, is the Chief Pilot. Dan has been involved in Hot-Air Balloons since 1973. At the age of 13 Dan became penpals with Wilma Piccard, wife of Don Piccard and together, they spurred Danny's love for balloons. Danny still has every single letter that Wilma sent him. An avid Hot-Air Balloon Pilot, Dan averages between 120 to 190 flights a year. To put this into perspective, an average Hot-Air Balloon Pilot flies 15 to 20 flights per year. Dan is also a Special Shape Pilot and he owns Burnie the Little Devil as well as flying US Flag Balloon and the Flighthouse balloon for Barry DiLibero. In the last few years, Dan has flown in China, the Phillipines, Puerto Rico, Canada and Mexico as well as all over the US. 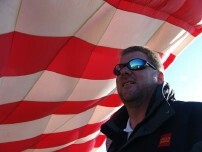 Danny deflating the US Flag Balloon in Albuquerque New Mexico at the ABQ Balloon Fiesta. Dan holds numerous Hot-Air Balloon records and awards. In 1998 he ranked 1st in the nation in the Balloon Federation of America's Long Jump Competition. He took off from Des Moines and flew East to the Indiana state line in 5 hours and 20 minutes covering 317.6 miles and reaching a top speed of 80 mph! In addition, Dan holds the distinction of being Iowa's furthest flying pilot! Dan was also the first to inflate and fly a Hot-Air Balloon in Veteran's Auditorium in Des Moines, an altitude record of "6 feet" was established January, 25th, 1997. In 1998 Dan also became the first pilot in Iowa in over 24 years to fly in the dark! He now offers this as a Passenger Ride option! These are known as "Dawn Patrols". Dan has a LifeTime membership in the BFA (Balloon Federation of America). Being a Member since 1989! Dan is also a BFA Level VII Prominent Aeronaut! Dan is also a FAA Safety Wings Program Level 12 Pilot! Campbell flies 1 to 2 Balloon Races a year as the balloon ride business keeps him busy at home. Usually Dan will fly a advertising balloon or a special shape balloon at an event. Dan was also ordained as a Minister in 2001 so as to allow him to conduct balloon weddings and cremain scattering ceremonies. In addition to owning and operating Z-Balloon Adventures, Campbell's company sells and rents Cold-Air Advertising Balloons and Advertising Blimps to companies and individuals to call attention to their on-sight advertising. Phil Gray, owner of National Ballooning, LTD is our backup ride pilot. Phil has been safely flying balloons since 1974. Barry DiLibero of USFlagballoon.com is our backup pilot for Burnie the Little Devil.